Marklon Polyglass® Polycarbonate Corrugated Sheet is the product of choice for cost-effective, high light-transmission, impact resistant, light weight, industrial and consumer applications. It offer the clarity of glass while filtering ultra-violet light; withstands wind and vandalism, This product also provides longer life span than PVC or fiberglass. 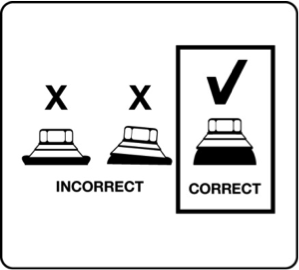 Kindly refer diagrams (below) on product specifications. Marklon Polyglass® Polycarbonate Corrugated Sheet is compatible with various metal is roofing structure and frameworks, therefore it is widely used in the market. High light transmission. 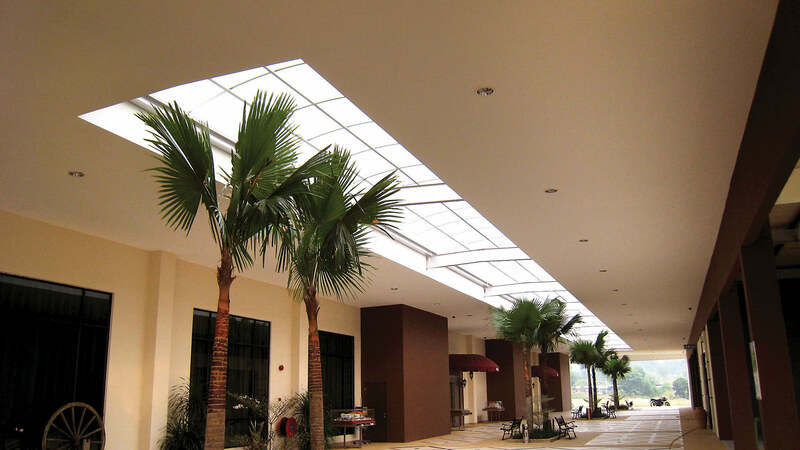 Transmit up to 90% of visible light, providing an optimal growing environment. High impact strength. Over 40 times the impact resistant of glass or acrylic, 20 times the impact strength of fiberglass, making it one of the safest building materials. UV resistant. Marklon Polyglass® Polycarbonate Corrugated Sheet is exceptionally resistant to weathering. It remain clear and non-yellowing for many years with minimal deterioration. Light-weight. It can reduces labour costs due to its light weight simplifies handling, transportation and installation particularly of long spans in high places. Thermal Insulation. Marklon Polyglass® Polycarbonate Corrugated Sheet can help save energy because of its thermal insulation capability better compare to fiberglass. Low Flammability. Marklon Polyglass® Polycarbonate Corrugated Sheet exhibits superior flammability performance when compared to typical fiber reinforced polyester (FRP) and acrylic sheet materials. STORAGE: Sheets stored outdoors should be protected from sunlight and rain by an appropriate opaque waterproof cover, and away from chemical contact. 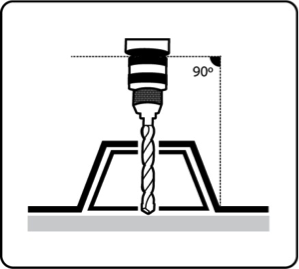 Drilling is done using a power drill with regular high-speed steel bits intended for metal, rotating. Keep all cutting and drilling areas clean. 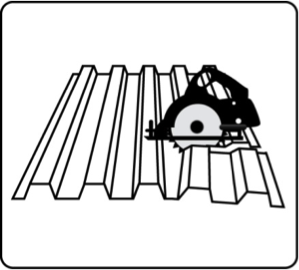 Blow away saw dust and drilling debris with compressed air. 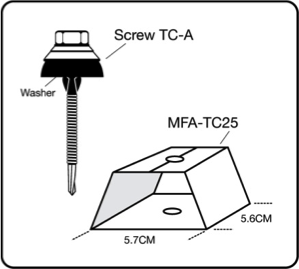 The above mentioned accessories are available to simplify the installation of corrugated polycarbonate sheeting. 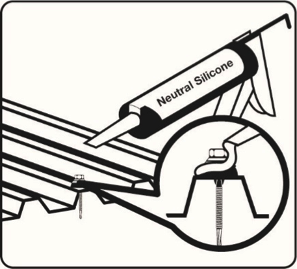 Neutral silicone apply on Marklon Polyglass Polycarbonate Corrugated Sheet. 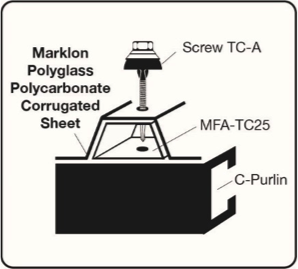 Place the MFA-TC25A Angular spacer onto structure (C-purlin) then use screw TC-A drilling into Marklon Polyglass Polycarbonate Corrugated Sheets. Use ladders, crawling boards and other safety equipment required for safe installation. Use all safety measures required according to local safety regulations. 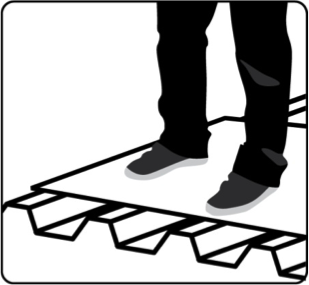 Don’t step on installed panels between support members for fear of falling. 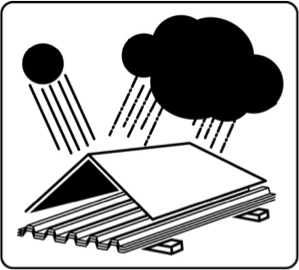 Rather, use a sturdy board adequate to support your weight and long enough to span at least three structural members.Never leave corrugated sheet unattended on the roof until all the required fasteners have been appropriately installed or the panels secured to the supporting structure.